Hmmm I forgot to add that the refusal was just before the general election last May, so no need to be so concerned about the residents anymore now for Wandsworth Council! In a recent comment, the leader of the Council Cllr Govindia mocked Battersea residents objecting to planning application, saying “as a percentage of the Borough’s population of around 310,000″ their number is insignifiant (even less significant in comparison to the entire population of England who does not object to Wandsworth’s schemes surely, ha ha!). Application 2015/5308 was a rehash of the scheme turned down by the Committee against the officers’ recommendation. On Tuesday 10th November, following lengthy discussion on the merits of the proposal, 98 York Road was approved by 5 votes to 4 (all labour Members: Ambache, Critchard and Belton voted against), the Chairman Cllr McDermott having used her casting vote to force approval of the scheme. Councillor O’Broin (Tory Councillor of St Mary’s Park ward, not a member of the Planning Application Committee) spoke on behalf of local residents, saying that the key concern was that this revised application was no different from an earlier application which the Committee refused on grounds of its massing/density and its unneighbourly impact and the draft Supplementary Planning Document (SPD) for Lombard/York area allows the Committee to refuse planning permission. While Cllr Belton and Labour members agreed with the ward Cllr, other Tory members of the PAC considered the application was different. It is not a copy paste indeed, with 4 meters step back on one side, and 10% less flats.However the overall design is 95% similar. In addition, Tory Cllr Sweet said that they cannot rely on draft policy: he is new obviously as all evidence in previous approved application that they often use emerging policy as a reason for granting permission when it can help them (including in this report, section 2.23)! Cllr Critchard raised concerns about the option for the Council and the applicant to negotiate and agree a commuted sum to be paid to the Council in lieu of on site affordable housing. She also asked that it be noted that reference in the paragraph 5.2 of the report that the scheme generates a “deficit” is misleading as it means to state that the scheme will generate “a slightly smaller profit” and the public needs to be clear this is the case. 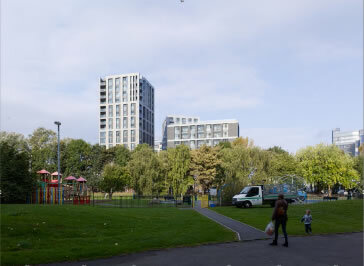 “The York Road Estate also contains other tall buildings, including 17-storey Penge House and 23-storey Sporle Court. The emerging Winstanley and York Road Estates Masterplan sets out a clear vision for the regeneration of this area and shows how this edge to York Road will be transformed with new high density development over the next 10 -15 years. As usual the level of affordable tenures is way below the Council’s target of 33% in every new developments. It is all offered as intermediate (no social obviously) with 43 one and 2 bedroom flats (the refused application offered 50 flats + £500k off-site contribution). In addition it is suggested by the Council (yes!) that the 13 of the 43 affordable units which are located in a block mixed with private tenure (it may give rise to a lack of interest from private owners, says the officer’s report), could be replaced by a lump sum payment instead (“most beneficial to the Council” indeed as the report writes). In order to show you the reliability of the so called “independent financial assessment” we need to read the comment of BNP Paribas: they conclude that the proposed scheme is not currently viable and generates a potential viability deficit of approximately £3.2 millions with the intermediate units based on the Council’s intermediate housing affordability criteria (according to BNPP: “the benchmark land value is £26.9million. With 25% on site intermediate affordable housing provision, the residual land value of the development is £23.7million“). The economic assessment submitted by the applicant showed a “deficit” of £2.21m). Therefore why do you want to build a scheme so much that you have made an appeal against the first refusal last May, and filled a second very similar application? Because there is no deficit (misleading at least, generally called a “lie” with common people). As Cllr Critchard pointed out, this is only a “a slightly smaller profit”! The development should pay nearly £5 millions to Wandsworth borough.